This sweet embroidery kit includes all you need except hoop. "I’m Tamar – illustrator, embroidery artist and mother of two. My passion for drawing has been a part of me for as long as I can remember. I’ve studied graphic design and illustration at WIZO Canada and have been illustrating children's books for several years. In the past several years I’ve also been giving my illustrations new life in the form of embroidery. My works are topically naïve, dreamy, yet they always evoke a deep internal emotion. Embroidery embodies my illustration perfectly, going into the smallest of details and enriching it with another dimension of style and depth. Instead of drawing with watercolors or pencils, I use needle and thread. 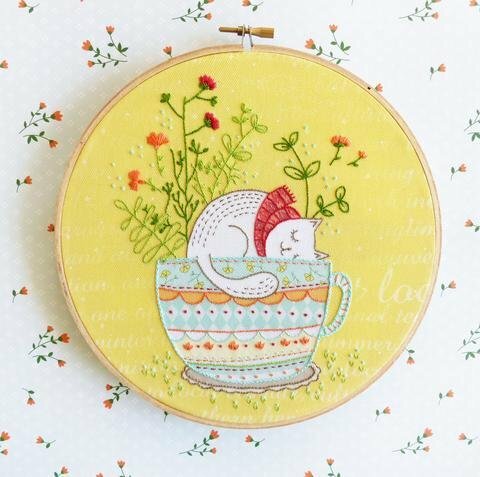 I love seeing my art come to life in embroidery, and take great joy in seeing other embroiderers take my illustrations and make them into something uniquely of their own."